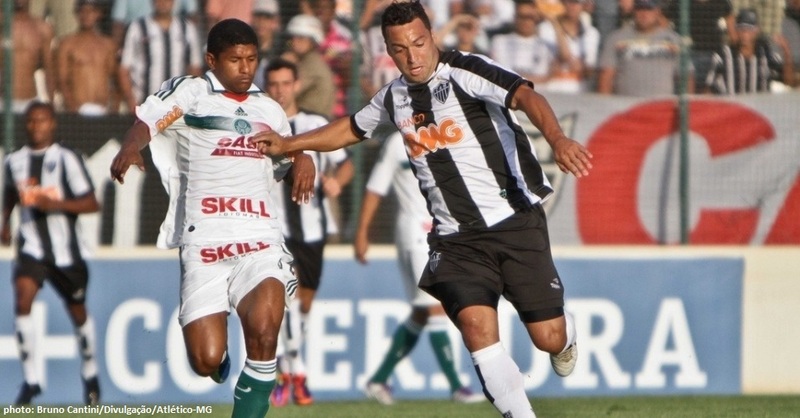 Sunday market Palmeiras’ third straight 2-1 loss. Expectations were sort of fulfilled, as Palmeiras faced a team with boosted morale after having beaten Fluminense 2-0 in the round before this one. Nevertheless, Atlético wanted to be on the safe side and paid up a US$ 110.000 fine to Palmeiras in order to have defensive midfielder Pierre on the pitch (for those of you less familiarised with Brazilian football: it is common over here to have a clause in the contract stipulating that players on loan are prohibited to play against their club unless a fine is paid – and as Pierre belongs to Palmeiras but currently plays for Atlético, the mineiros had to cough up the silver to have him play on Sunday). For relegation-threatened Atlético and in hindsight, I guess it was a good investment. The Verdão played the last 30 minutes first one then two players short, as Maurício Ramos and Valdivia left their brains somewhere else and both saw the red card. Valdivia… What a disappointment. Our captain was clearly holding back when stating last week that this is the worst year in his career. Let me assure you, dear reader: it’s worse than that. Being sent off means he will not face Coritiba on Sunday next, nor be available for the two coming games against Grêmio and Vasco da Gama, as he will be serving the Chilean national team. Magnificent. I’d be much surprised if he’s part of the team in 2012. If you can be bothered, game highlights below. With only six rounds to go, what are we looking at? Well, first of all, a squad in utter disbelief. We must praise the Lord for Palmeiras having done a good/great first half of the championship, because otherwise… Second: we face respectable opponents in these coming rounds, almost all of them either chasing the title, a spot in next years’ Libertadores or trying to avoid relegation. There’s not one single easy game ahead. It might not be likely, but it’s absolutely possible that Palmeiras lose ALL remaining games this season. Are we toast? It’s sad, it’s pathetic, it’s even demoralising in a larger sense of the word, but it might be utterly necessary: in order to motivate out players and have them chase those few points needed in addition to disturb our rivals Corinthians and São Paulo in their aspirations for the championship title and the Libertadores Cup respectively, Palmeiras might have to offer them bonuses. Players who already earn a fortune and have performed badly this year might soon be staring at a rather impressive carrot. Go figure.